I’m obsessed with good customer service and responding FAST. Maybe it’s because I’m the type of person who can’t get any real work done until my inbox is empty. Or maybe it’s because I can’t stand when other people don’t get back to me quickly. Or maybe it’s because I’m impatient as hell and want the answers I need right now and so I assume others demand the same. Whatever the reason, I take responding promptly to a whole new level. (At least I used to before my son was born.) Emails had a reply in minutes. Phone calls were returned within the hour. Clients were damn impressed too. Who wouldn’t be when so many other companies drop the ball? What’s a “prompt response” when we’re talking about customer service? We all have a different idea of what a prompt response is. Like I said above, I was truly OBSESSED with getting back to my clients ridiculously fast. So for me, my opinion on what a prompt response is has changed. Just a little. It used to be minutes. Now it’s hours. I’ve realized that in most people’s lives, minutes just isn’t realistic. Or even possible. For argument’s sake, let’s define a prompt response in customer service as one that takes place within the same business day. I think this is more than fair, isn’t it? So if you get a new lead inquiry at 10am on a Tuesday, reply by 5pm and you’re in the prompt response zone. (Although, 5pm might be stretching it so I’d aim for a little sooner than that.) Reply on Wednesday at noon? No good. After my little prince was born, although at first I tried to keep my response time to minutes just as it was before, my customer service reply times quickly turned to an hour and sometimes two or three. My new leads and existing clients were still making comments like, “Katie, thanks for getting back to me so quickly” and “I really appreciate the quick response…” and “Thank you for your prompt return of my call”. Huh! Imagine that. I think I’m taking forever to get back to someone and they think I’m Speedy Gonzales. Time for a change in perspective. Like I said in my post about life’s ultimate transition to new mom, when you have a kid, things change. We’re not in Kansas anymore, Toto. You find yourself in a position to rethink. Readjust. Reevalute. Redefine. Just because you used to get back to clients in a few minutes, if you respond within a few hours now, I’m telling you that they’re likely not even to notice. So relax. Minimize your stress. (Don’t you already have enough of it?!) Settle in to your new definition of a prompt response. No, no, no. It’s fine. Your clients will appreciate a response back within a few hours. I’ve witnessed this firsthand, which is what made me stop and think about all the added stress I was putting on myself to be so fast. I realized, hey, I’m still fast. Before I was ridiculously fast. Now I’m just fast. And I can live with that. Don’t let this slight change in a timing perspective be the tipping point in your business. Just because you’ve become a tiny bit more slack on how strict you are with your response times, doesn’t mean you can let go and start changing a whole whack load of things. Your clients have expectations of you. They’ve come to appreciate what you do and how you do it. If anything, it’s time to step it up in other areas. 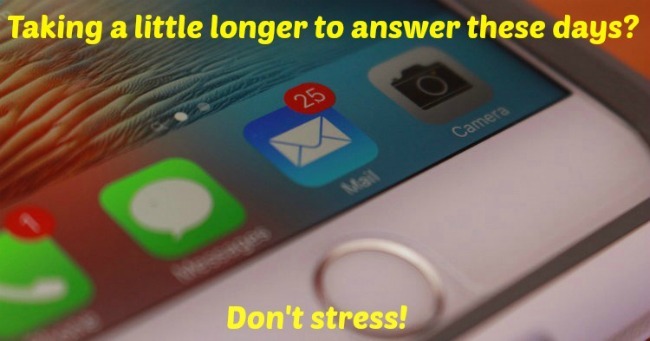 So you take a little longer to respond now. But make sure your responses are still as friendly and thorough as they’ve ever been. Be detailed and informative. Accommodate client needs. Don’t miss deadlines. Deliver on promises. Go above and beyond. Just don’t beat yourself up because your average response time is 2 hours and not 2 minutes. Give yourself a break. You’re a mom now. And a business owner. You rock! And plus, the likelihood of anyone caring as much as you do is pretty damn slim.